This is a group of 2 antique Victorian Edwardian estate pieces for repurposing or repair. One is a Victorian fancy repoussed gold filled pendant pin and the other is an Edwardian pin. Both are missing their pinbacks. The gold filled Victorian repoussed pendant can be used the way it is now as a pendant . 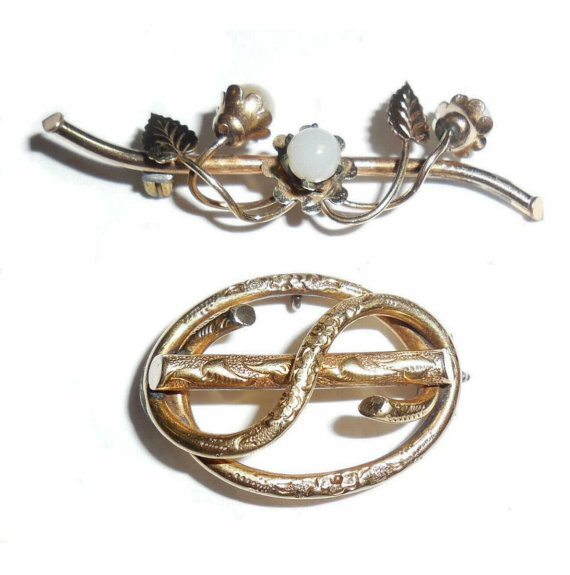 The long Edwardian pin has wear on one pearl and one back edge. It needs a pin rod in order to be used. Size of the pendant pin is 1 3/16" by 13/16". 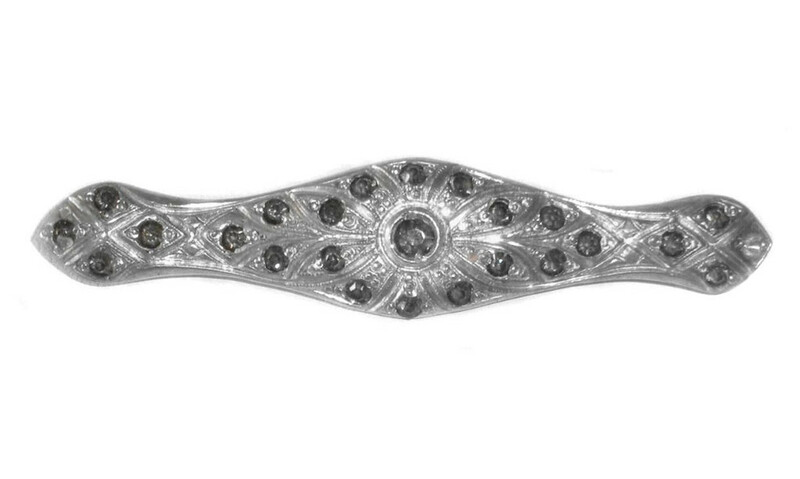 The Edwardian pin is 2" long by 1/2". nice antique Victorian group for repurpose or repair. OR, just use the pendant! Very large vintage 1960s vintage large articulated owl pendant in beautiful condition with its thick heavy fancy gold plated chain. It is old 1960s store stock from the estate of a jewelry store owner/disributor from White Plains, NY. 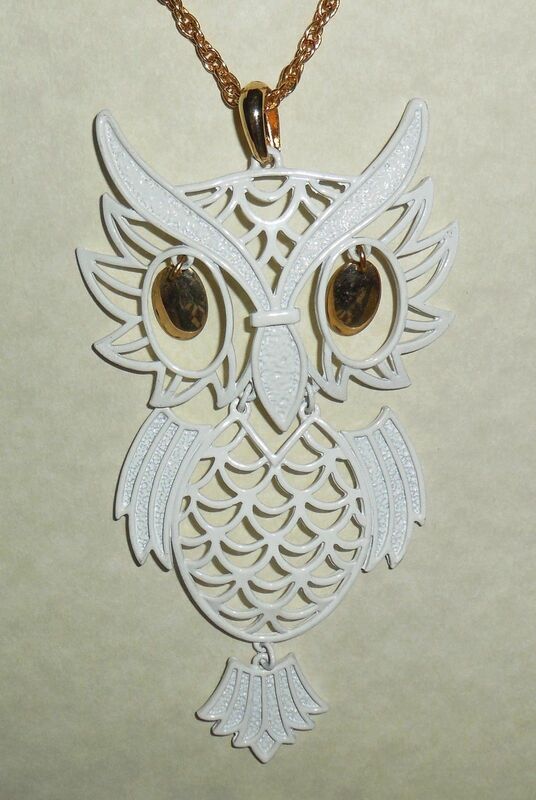 The owl is jointed, articulated and movable with gold dangling eyes. Just the pendant is 3 1/2" long, North to South. The chain is 24" long with heavy gold plating that is bright and shiny. Total length is 28". A BIG SHOWY vintage statement necklace in crisp clean condition for your collection. 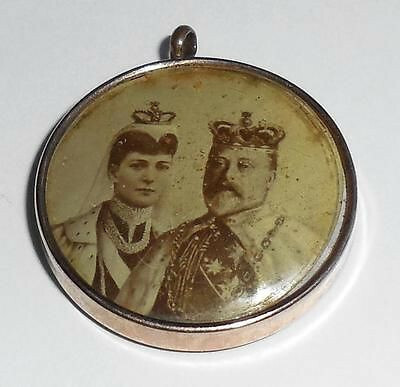 I understand that these are so popular that they were but not with these thick heavy gold plated chains and thick white baked in enamel. 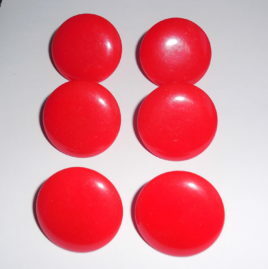 3 Pair Vintage Cherry Red Mid Century Bakelite Clip On Earrings - Group of 3 pair of cherry red bakelite disc earrings. Simichrome tested and Guaranteed old bakelite. They have very strong 1960s hinged clips glued to the backs. Size of each earring is 1 1/8" across in diameter and cover most of the earlobe. Overall condition is excellent. No damage or repair. These came from the estate of a 1960s mid century jewelry store. Old store stock in the basement for decades. Total of 6 pieces, 3 pair. Lovely unused bakelite find for you! 3 Pair Vintage Marbled Green Bakelite Clip On Earrings - Group of 3 pair of marbled lime green bakelite disc earrings. Simichrome tested and Guaranteed old bakelite. They have very strong 1960s hinged clips glued to the backs. Size of each earring is 1 1/8" across in diameter and cover most of the earlobe. Overall condition is excellent. No damage or repair. These came from the estate of a 1960s mid century jewelry store. Old store stock in the basement for decades. Total of 6 pieces, 3 pair. Lovely unused bakelite find for you! 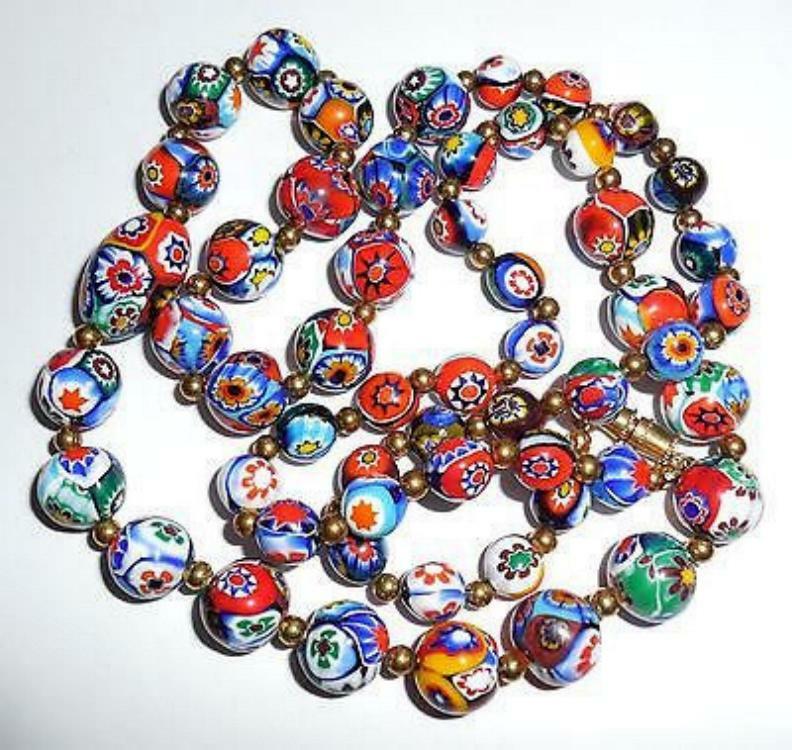 This is a vintage Italian Millefiori hand made art glass necklace in excellent condition. It is very well made with double floss that is still strong, old gold filled/plated connector beads and a solid brass barrel clasp. Size is 30" long and heavy. Weight is 98.9 grams. 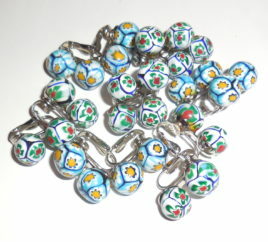 The beads graduate from 7mm to 15mm and are made of separate sections that are enameled and fused by hand. Beautiful deep rich color on every bead. A gorgeous 30" art glass statement necklace for your collection. 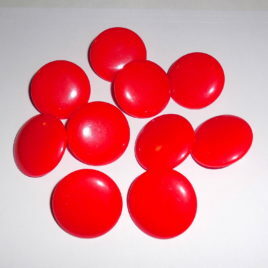 5 Pairs Vintage Cherry Red Bakelite Pierced Post Earrings - This is a group of tested and guaranteed bakelite earrings in cherry red color and large 1.18" size. They are from the 1970s to 1980s and have a lacquer finish. So, in order to test them properly we cut one extra earring and were able to smell the burnt electronic smell associated with bakelite. We also simichrome tested the inside. Additionally, the earring charred but did not melt when placed over fire. They are deep cherry red color, much truer red than the photo could capture. Unknown if they were ever drilled. They have strong and securely glued backs with silverplated covers and posts and stainless butterfly catches. Any glue marks you may see in the enlarged photos are not eye noticeable when the earrings are worn on the ear. All are in excellent, condition. Old store stock from an establishment in business from the 1960s to 2005 and were stored away for decades. Lovely group of 10 pieces of vintage bakelite for you and yours! They are large colorful and showy! 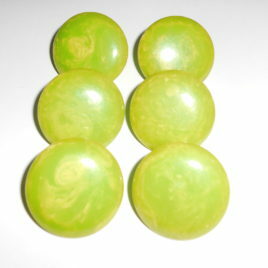 5 Pairs Vintage Marbled Green Kiwi Lime Bakelite Pierced Post Earrings - This is a group of tested and guaranteed bakelite earrings in marbled green kiwi lime color and large 1.18" size. They are from the 1970s to 1980s and have a lacquer finish. So, in order to test them properly we cut one extra earring and were able to smell the burnt electronic smell associated with bakelite. We also simichrome tested the inside. Additionally, the earring charred but did not melt when placed over fire. 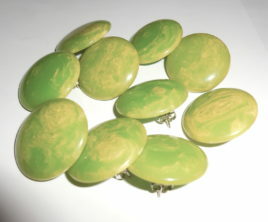 They are a lovely light medium kiwi lime green color with yellow marbling, somewhat more muted baeklite color than the photo could capture. Unknown if they were ever drilled. They have strong and securely glued backs with silverplated covers and posts and stainless butterfly catches. Any glue marks you may see in the enlarged photos are not eye noticeable when the earrings are worn on the ear. All are in excellent, condition. Old store stock from an establishment in business from the 1960s to 2005 and were stored away for decades. Lovely group of 10 pieces of vintage bakelite for you and yours! They are large colorful and showy! 6 Pair Murano Blue White Red Vintage Glass Pierced Post Earrings - Group of vintage handmade blown enameled Murano art glass glass, silver plated, pierced post earrings with butterfly backs. Each measures 8mm to 9mm and has pretty mix of blue, red and white colors. They are from the estate of a mid century jewelry store, 1970s to 1980s old store stock. Never used. No damage or repair. Any glue marks you may see are not visible when worn on the ear. Store in operation from 1960s to 2005 and these were stored in basement for decades. They are drilled with glued in posts. Butterfly backs. Excellent unused condition. No damage or repair. A lovely group of good sized vintage Murano glass earrings for you or for resale! 6 Pair Murano Blue Yellow Vintage Glass Pierced Post Earrings - Group of vintage handmade blown enameled Murano art glass glass, silverplated pierced post earrings with butterfly backs. Each measures 10mm to 11mm and has pretty mix of blues and yellow colors. They are from the estate of a mid century jewelry store. 1970s to 1980s old store stock. Store in operation from 1960s to 2005 and these were stored in basement for decades. They are drilled with glued in posts. Glue is not visible when earrings are on the ears. Butterfly backs. Excellent overall condition. No damage or repair. Never used. A lovely group of good sized vintage Murano glass earrings for you or for resale! 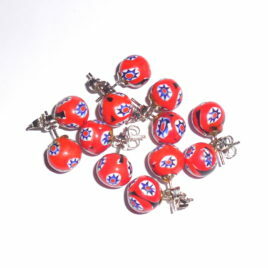 6 Pairs Vintage Enamel Blown Glass Double Bead Lever Clip On Earrings - Group of vintage blown enameled Murano glass double bead clip earrings with levers on the clip. 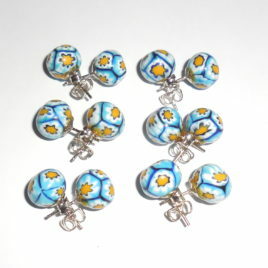 Each Murano glass bead measures 10mm and has pretty mix of blue, green, yellow and white colors. They are from the estate of a mid century jewelry store, 1970s to 1980s old store stock. Never used. No damage or repair. Any glue marks you may see are not visible when worn on the ear. Store in operation from 1960s to 2005 and these were stored in basement for decades. They have strongly glued on backs and are very secure. The clips have levers. Excellent unused condition. No damage or repair. 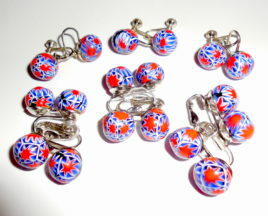 A lovely group of 6 pairs of good sized vintage Murano glass earrings for you or any reseller! 6 Pairs Vintage Enameled Blown Glass Screwback Screw Clip On Earrings – Group of vintage blown enameled Murano glass double bead clip on and single bead screw back earrings. 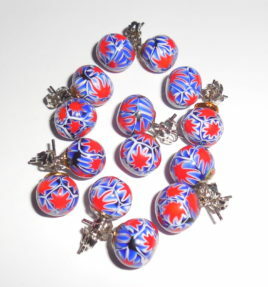 Each Murano glass bead measures 10mm and has pretty mix of blue, red and white colors. They are from the estate of a mid century jewelry store, 1970s to 1980s old store stock. Never used. No damage or repair. Any glue marks you may see are not visible when worn on the ear. Store in operation from 1960s to 2005 and these were stored in basement for decades. They have strongly glued on backs and are very secure. The clips have levers. Excellent unused condition. No damage or repair. 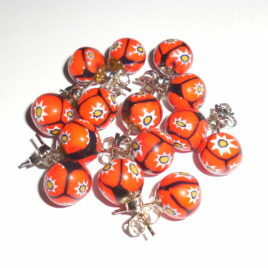 A lovely group of good sized vintage Murano glass earrings for you or any reseller! ***Sorry for photo glare; the metal backs are bright, shiny silver, no discoloration at all! Group of 7 PAIRS of old store stock 1970s to 1980s vintage blown glass enameled Murano bead stud earrings, pierced post with butterfly backs. They have a pretty multi color mix of red, yellow and black colors. Each earring is showy and noticeable at 9mm to 10mm size. They have silverplated posts with stainless butterfly backs. Any glue marks you see on the backs in the enlarged photos are not visible when the earrings are worn. Unknown if they are drilled but they do have back covers on the beads that are glued and secure. Never used and in like new condition. They are from the estate of a mid century jewelry store. Store in operation from 1960s to 2005 and these were stored in basement for decades. A lovely group of good sized vintage Murano glass earrings for you or for resale! 7 Pairs Italian Murano Blown Enameled Glass Pierced Post Earrings – Group of vintage handmade blown enameled Italian Murano art glass, silverplated pierced post earrings with butterfly backs. 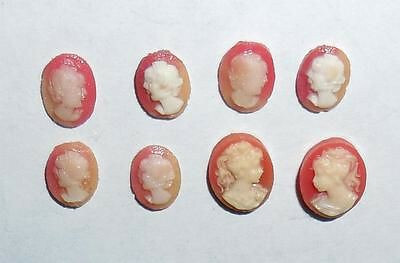 Each measures 9mm to 10mm and has pretty mix of blue, red and white colors. They are from the estate of a mid century jewelry store, 1970s to 1980s old store stock. Never used. No damage or repair. Any glue marks you may see are not eye obvious when worn on the ears. Store in operation from 1960s to 2005 and these were stored in basement for decades. Butterfly backs. Excellent unused condition. No damage or repair. A lovely group of good sized vintage Murano glass earrings for you! 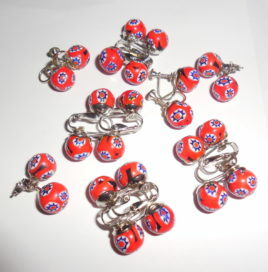 8 Pairs Murano Enameled Art Glass Earrings Pierced Post Lever Clip Screw - old store stock 1970s to 1980s vintage blown enameled art glass Murano bead screwback, pierced post and clip on earrings. There are 2 pair of pierced post, 2 pair of screw back and 4 pairs of double bead leverback clip ons. They have a pretty multi color mix of red, white and blue colors. Each earring is showy and noticeable at 9mm to 10mm individual bead size. They have old silverplated screwbacks that are well made and secure. Any glue marks you may see on the backs in the enlarged photos are not eye noticeable when the earrings are worn on the ears. Unknown if they are drilled but they do have back covers on the beads that are glued and secure. Never used and in like new condition. They are from the estate of a mid century jewelry store. Store in operation from 1960s to 2005 and these were stored in basement for decades. A lovely group of good sized vintage Murano glass earrings for you or for resale! This is a stunning antique Art Deco long pot metal pin with paste stones that resemble faux sapphires. From a collection of estate jewerly and it needs one stone. Size is just about 3" long by 5/8" wide in the center. Many of these very early pot metal pin either have a lot of wear or never survived. The metal on this one is gorgeous. Very hard to find early pot metal pins in this condition. Just glue in a similar stone and you will have a knockout early pot metal pin for your antique jewelry collection or display. This is a very fine example. 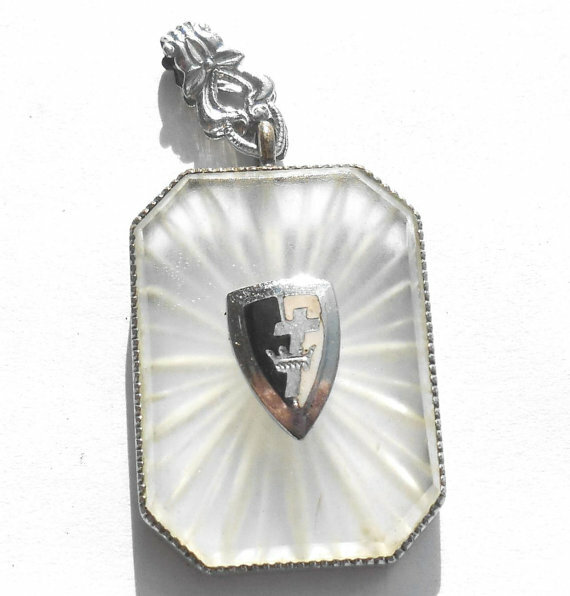 This is a 1920s to 1930 camphor glass and rhodium/platinum plated masonic knights templar pendant with its original enameled knights templar fraternal logo on the front. It also has its original, fancy bail and back screw. The fraternal symbol is screwed directly through the glass the old way. The camphor glass is much brighter and better than the photo and has a very deeply carved sunburst . There is also very detailed deep millgrain cut work on the edges of the bezel. Size is 1 9/16" tall North to South including the bezel by 3/4" wide across the center East to West. Condition is excellent. No damage or reapair. No cracks or chips or wear to the camphor glass. No wear to the rhodium plating. No enamel wear. This is a lovely statement pendant for your antique jewelry collection.